'Trendease on the Move' features short, impromptu video clips from our travels. While the clips may not have all of the bells and whistles of Trendease DesignVision, we hope that they will inspire you none-the-less. Many substrates, oodles of applications, a single merging print design cascading across the stand of HP, designed and curated by Jennifer Castoldi, with surface design from Poppy Print Studio. Keep reinventing. The only limitation is your imagination. Here's an attention grabbing digitally printed textile-wrapped car for your amusement, scouted by Trendease during Heimtextil 2019. 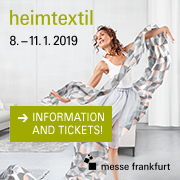 'Sleep at Heimtextil' previews smart textiles and "homeables", wearable technology translated into home fashions. Live production of smart textiles will take place in May 2019 at Techtextil / Texprocess. Trendease will be there reporting live from the events. We are coming to you straight from the exhibition floor of Heimtextil 2019 in Frankfurt, Germany, where Trendease is exploring the new Hall 4.2 featuring the Interior.Architecture.Hospitality zone. We are excited about this novel material innovation for walls: digitally printed acoustic wallcoverings from Italy by Tecnografica. Trendease designed and curated the stand for HP at Heimtextil, bringing in some talented surface designers. Known for hidden images with meaning, Katja of Elli Popp has added some here in her Cosmos collection for the bar and lounge nooks. Look closely at the seating, wallpaper disks, and tabletop, each containing a theme as the titles convey: Plastic, Oil, and Space Pollution, or Dying Bees. Surface design can have an impact far beyond that of pleasing aesthetics; it can be a catalyst for conversation and a positive influencer. Biophilia. Kew Gardens are forever an inspiration to creatives based in London and visiting from around the globe. Annette Taylor Anderson has based her latest collection ‘All Things British’ on excursions to these enchanting grounds. This intricate backlit mural was sketched by Arka Chergui. Swooshing overhead, the length of the entire stand, is ‘Kews Ghost Roses’, underfoot is ‘Kews Leafy Florals’ and hanging above the bar are four Cork lampshades from Innermost. The six lampshades in the center of the bar lounge boast ATADesigns’ prints and are produced through Innermost’s own made to order shade business. Trendease designed and curated the stand for HP at Heimtextil. We called upon Sasha Donkin who is influenced by the effects of global warming: she uses ice-dyeing; it is like tie-dye with an environmental message. Complementing Sasha’s designs in the bedroom are Charlotte O’Reilly’s immaculate illustrations. Special thanks to Innermost for their Lighthouse lamps, which give off the look of sunlight shimmering through ice in this interior. Trendease designed and curated the stand for HP at Heimtextil. An office design is made to be as relaxing as possible by using interactive wallcovering with Dupenny’s mermaids to entertain the young ones and antibacterial wallpaper to keep germs at bay, plus latex inks are VOC-free. From South African surf photographer Kelly Cestari we incorporate a soothing wave to curl from the wall onto the vertical blinds for a calming effect during consultation. The lightbox is not only for x-rays; it is an ideal spot to demonstrate the different substrates available for backlit digital prints. Majeda Clarke is an additional talent discovered by Trendease for the 1st Launch Pad at MoOD. She set out to learn the weaving method of the celebrated ‘Jamdani’ cloth, once acknowledged as the finest, sheerest cloth woven and spun by human hand, ‘Mal Mal’ or ‘woven air’ as the Romans called it. This textile has UNESCO World Heritage Status. Another new talent scouted by Trendease for the MoOD Launch Pad is Kathleen Farren, who aims to push the boundaries of textiles by taking an experimental approach through her use of materials and techniques and takes inspiration from industrial urban metalwork like manhole covers and fencing. ‘Food as an Image’ and ‘Velbekomme’ (meaning Bon Appétit in Danish) are both projects centered on Cecilie Elisabeth Rudolph’s personal passion for food. They are also a response to the numerous culinary trends in pop culture. From caviar-beaded detailing to edible lace, this was a hit on the Launch Pad at MoOD Brussels. Katie Gillies was scouted by Trendease for the inaugural MoOD Launch Pad. She specializes in material innovation of textiles, wood, metal, and plastic. 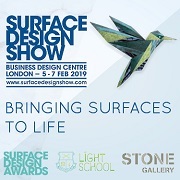 “A mixture of contemporary process and materials has been used to create this collection of surface coverings that could be applied to interior, industrial and architectural spaces,” notes Katie. During Indigo Brussels Trendease caught up with Tom Sutton, lecturer at the University of Bolton School of the Arts, United Kingdom. Tom discusses highlights of the Textiles and Surface Design courses while we get to take a look at examples produced by the students: non-wovens, prints, embellishments, and a spotlight on the employability project. Another intriguing innovation Trendease brought to the Launch Pad at MoOD was SpacEmotion from Diffus Design. This modular textile disc system can act as a light source, speaker, smoke alarm, and even a scent dispenser. 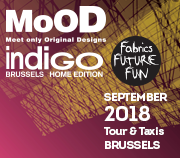 Many more inspirational Launch Pads can be discovered at MoOD September 6-8, 2016 at Tour & Taxis in Brussels, Belgium. The 2nd edition of Heimtextil’s Theme Park is open to the public! Trendease speaks with some of the members of the Trend Table about the Well-Being 4.0 theme for 2016/2017. Take a journey through five of the trend cocoons and get a sense of the directions for the coming seasons. More in depth reports will publish on Trendease.com soon! Scouted by Trendease International, the Indigo Launch Pad exhibitors in Brussels highlighted talent from the institutions offering degrees in surface design. Lianne Cooley, recent graduate of Cleveland College of Art & Design, creates digital designs for wallpaper and interiors by manipulating hand-painted art with computer software. Launch Pad is a fresh initiative by MoOD, curated by Trendease International, showcasing some of the brightest talent entering the home fashion arena scouted from around the world. First up is Rand Gylden, a woven textile design and development company, founded in October 2014 by Danish Design Duo Signe Rand Ebbesen and Simon Gylden. With support from the Department of International Trade Promotion, Colours of Thailand is a weekend-long extravaganza at Westfield London for the public to experience Thai culture like never before. The home spa has grown in importance with recent lifestyle shifts and these products and services offer rest, relaxation, and rejuvenation for all. Trendease on the Move: Fabric Made from Milk! Fabric made from milk?!?! You read correctly. Let your inner textile nerd rejoice with this technical introduction by Qmilk founder, microbiologist/fashion designer, Anke Domaske. In the symposium snippets, learn about milk as a textile, how Qmilk is made, the qualities of the material, and the wide range of product categories to which it is applicable. Individualized on demand digital printing is the future of personalized design. At Texprocess 2015 Brother had on display its CMYK printer, which was printing unique patterns and motifs on Converse sneakers, as well as t-shirts, and could even apply to decorative pillowcases. Great for in-house proofing or customized retail experiences. This instantly customizable t-shirt with LED screen, known as the “tshirtOS 2.0”, from Switch Embassy with Forster Rohner technology, won the Techtextil New Concept Innovation Award 2015. The tshirtOS is reported to be the world’s first washable digital t-shirt and has the potential to be used in other fields such as interior textiles. On the eve of the opening of the 2015 editions of Messe Frankfurt’s Techtextil and Texprocess fairs, Trendease got an avant-première showing of the Innovative Fashion Show scheduled to hit the runway daily in the foyer of halls 5.1 and 6.1. Functional materials and high tech fashion highlights are coupled with hot dances moves. Students from the Technical College of Apparel Design draw inspiration from the 2015 collections of Heimtextil exhibitors, like Pad Home Design, to bring us the “Ambitious Style Mix”, a mélange of material combinations for a new visual perspective of color, pattern, and texture. Jay and Jade Blades are founders of Out of the Dark, “a charitable social enterprise that recycles, restores and revamps salvaged furniture as a means to train, educate and employ young people from disadvantaged backgrounds”, located in High Wycombe, former capital of chair manufacturing in the U.K.
Live from the Thailand International Furniture Fair, we visit the Design Plant, a showcase for local design studios to present their goods to the global market. In a sea of wood and metal, color pops out; it is a design trend also seen around the world, gaining momentum in larger pieces and case goods. The Collider by Paul Ferragut is an interactive, personalized printer linked to an iPad. Once users select their designs and colors from the Generate Collision trend palette, the algorithm is translated to a one-of-a-kind piece. Here lies an opportunity for mass-customization. A child enjoys interacting with the Body Paint installation by Memo Akten within the Generate Collision section of the Heimtextil trend forum. Paint on a virtual canvas using your body movements, gestures, and dance as the brush. No cleanup required. At the 'Young Creations Award: Upcycling' Carolin Dietmann talks about her 'Crashing Barcelona' upholstered piece that takes work wear and scaffolding to a luxurious level, inspired by Mies van der Rohe's Barcelona Chair. On the eve before Heimtextil opens its doors we present you with this sneak peek of the four trends on show in the Trend Forum for 2014/2015 titled Progress! Revive! The final touches are still under way... So exciting! Stefan Schwabe and Jannis Hulsen present a bacterial cellulose at Heimtextil that can be grown and fashioned into unique forms. Visit them to see it for yourself in the Engineer Nature Trend space in Forum 0 at Messe Frankfurt. Khun Taa explains to us how he has interpreted the shape and fabric ties at the bow of the boats found in southern Thailand and developed a new leather chair with them in mind. Culture is a reoccurring theme in his work. It's day #1 at the Thailand International Furniture Fair (TIFF 2012) with Jennifer Castoldi. Here is a quick teaser featuring design highlights from the show. At the Thailand International Furniture Fair this 2012 under the brand name Kassra, Pariyaporn (Koi) Thammarungsee designed the Mr. and Mrs. leather chairs for Mobella. Colleague and designer Taa Anuphon explains the new concept with Jennifer Castoldi of Trendease International, media partner to MyThaiDesign. Interview with Jennifer Castoldi and Dr. Singh Intrachooto. More text and product images at www.trendease.com in the March 2011 issue, Trendease Weekly Newsletter #351. This interview corresponds to Trendease Weekly Newsletter #352 in the April 2011 edition. This video is part of Jennifer's June Journal in the June 2008 issue of Trendease. Visit www.trendease.com for more highlights of the DMY Berlin International Design Festival.